“The Producers” features adult themes and profanity. “The Producers,” a new Mel Brooks musical; Book by Mel Brooks and Thomas Meehan; Music and Lyrics by Mel Brooks; Original direction and choreography by Susan Stroman; By special arrangement with StudioCanal. 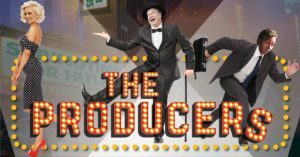 “The Producers” is presented through special arrangement with Music Theatre International (MTI). All authorized performance materials are also supplied by MTI.